Downtown Budapest, 6 October, 21 degrees Celsius. I’m trying to warm up my tired legs before the upcoming marathon relay. 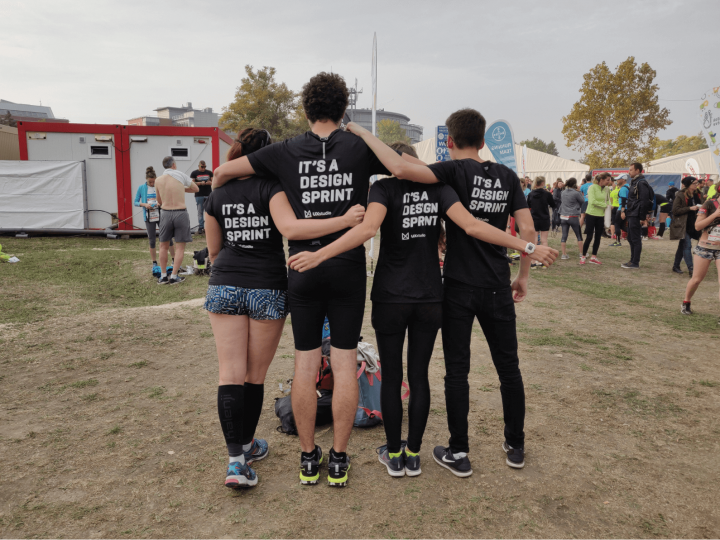 Above my shorts, my black sports shirt says in a big bold title, “It’s a design sprint”. The design sprint process has clearly impacted me in all areas of my life. We found this a wonderful joke at UX Studio when we created our company’s first running t-shirts, even though we knew the vast majority won’t get it in most competitions. To make it easier to understand why we really love to run a design sprint so much at UX Studio, we created a list of its biggest benefits. I hope this short summary can help you understand the design sprint process’ greatest values. Imagine a world where you can work as effectively as possible. 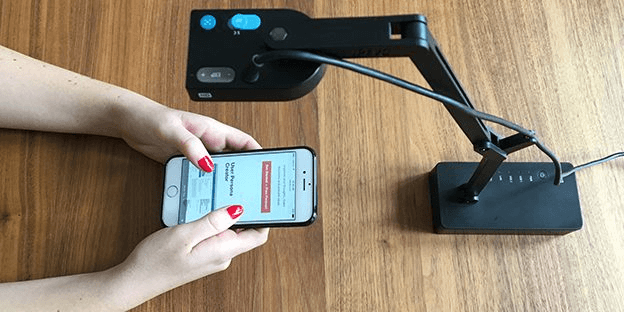 Now imagine you can reach the same level of productivity together with your colleagues. You can gather every important detail, come up with the best ideas and make quick decisions. Do you get it? Author of The Design Sprint Jake Knapp offers a path to this vision. But what constitutes a design sprint? What are design sprint workshops? Are there specific “design sprint steps”? Does it really merit trying it out on your team? In 2003, Knapp – future father of The Design Sprint – realized that what he was doing at work wasn’t working. So he got interested in optimizing work mechanisms. Later, working at Google, he discovered the inefficiency of traditional brainstorming on his teams. At that point, he started to elaborate a quick, intense, five-day idea-validation, the design sprint process. After these five days, you don’t just get an idea, product or design tested but also learn a very useful and exciting design sprint methodology which your team can use later on. Time best motivated Knapp, a master procrastinator. The first occasion he tried out the very first version of the design sprint process, he didn’t even call it a sprint yet. He just had to finish a feature for Gmail’s inbox very fast. This determined the tight schedule of five days. In them, you and your team work very intensely together, hence the name “sprint”. But it also involves speed and efficiency. After five full days, you get a design idea created and tested. Usually, a design sprint team consists of six or seven people from every part of your team. The more diverse the participating team, the better. A finance expert, marketing expert, tech expert and designer usually participate. Last but not least comes the “decider”, usually a CEO or PO or head of product. Someone takes responsibility for the particular project/product. With the help of this diverse team, we can ensure to not leave out anyone’s viewpoints, opinions or problems from the planning. On the first day of the design sprint process, your team defines what to focus on during the week. You think about long-term goals and also mayor assumptions and questions. A design sprint works especially well when your team faces a big problem which can require a lot of money and time to solve or as you prepare to kickstart a completely new product, feature or service. A design sprint can also come in very helpful when you simply get stuck somehow in your project. Aim to show enough courage and ask really important questions at this phase of the process. We have a great article about this topic if you are still wondering when to use design sprints in your team. After setting the main long-term goals and gathering your assumptions, your team creates a very simple map to visualize your product/service process. In the second half of the day, invite additional professionals from your company to check the map you have created and add as much information as possible. This lets your sprint team really grab every detail of your current process. At the end of the day, your team will decide where to focus in the design sprint process, what problem to solve with the help of these additional stories. This can help you reach your long-term goal. 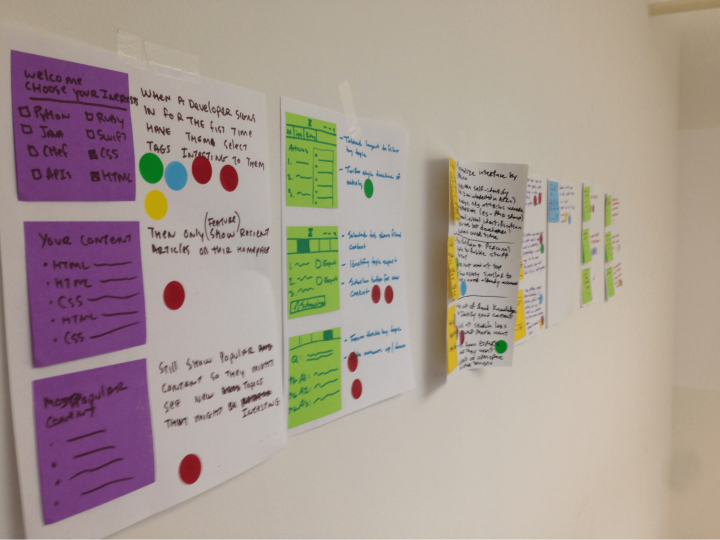 The design sprint process is truly a great tool to get your team on the same page. We have written an article about other workshops that can help you with just that. On the second day of the sprint, you already have the main target to focus on. This gives your team some time to gather ideas from anywhere which might help in your process. We usually help teams gather ideas from very different places and industries. Then present the different solutions in three-minute “lightning demos”. This gives the team a great base of inspiration from completely different sources. For example, in one of Knapp’s earliest design sprints, a robot engineering team watched cartoons and animated movies to find the right eye design for their robot. During his years at Google, Knapp also realized that team brainstorming didn’t really work anymore. On the second day of your design sprint process, your team generates many ideas without any brainstorming sessions but using a lot of individual work and energy. During the afternoon, your team sketches very different ideas. First, create notes and random sketches. Then also use a sketching technique called “crazy eight”. Next, everyone in the team chooses their best ideas and creates big, poster-like “Solution Sketches”. These plans should already come out far more elaborate than the usual quick “post-it ideas” after a team brainstorming. After working on these worked-out plans, post them on the wall. Present and vote on these ideas the next day. On Wednesday your team learns how to make big decisions without long arguments. First, everyone in the team gets some time to thoroughly look through the Solution Sketches on the wall. Then your team uses dot stickers to mark interesting ideas and solutions. This already prioritizes ideas without any kind of discussions. 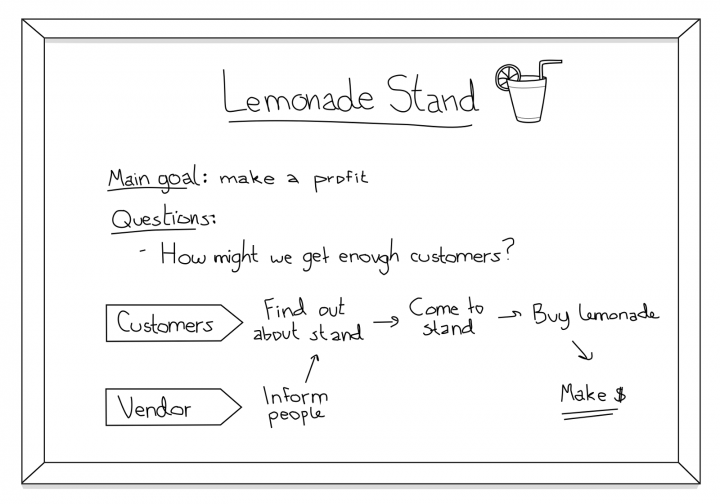 It also starts solving business questions through design. Next step of the design sprint process: the facilitator presents your Solution Sketches. This plays a very important part in the decision making process. We have to keep the creators’ identity secret at this point because the presenter’s personality can influence the opinion of an idea a lot. During the presentation, you learn methods to discuss these ideas in a very effective way, using a technique called “speed critique”. Whenever a question or problem comes up, silently post it near the idea or solution. After the presentation, the creator of the solution sketch reveals themselves and they can quickly answer these questions if needed. This avoids long, unfruitful team conversations and debates. After clearing all questions, use different voting methods to help the stakeholder in their final decision. The rest of the team places final votes on the solution sketches and tell why they have chosen a certain solution. Then the decision maker takes the last decision. They decide which Solution Sketch (or ideas from the Solution Sketches) to create during the sprint. Following the big decision, your team prepares for the next day and creates a storyboard from the chosen solution sketch (or sketches). Your team creates this flow together which will serve as a main guide for the next day. 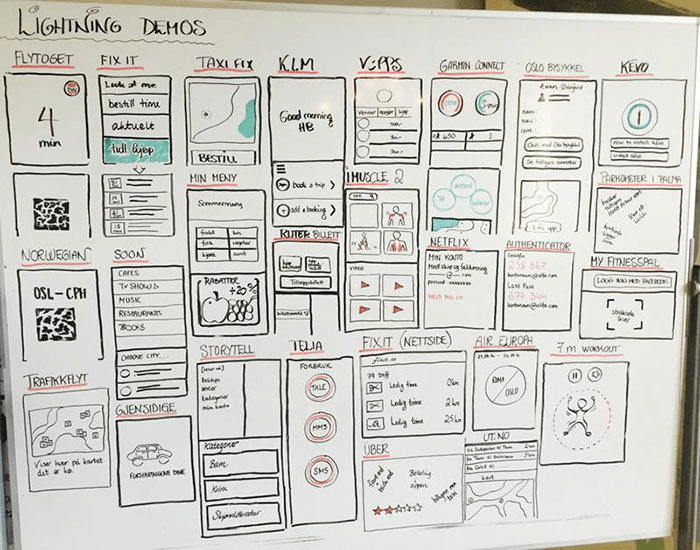 This big storyboard contains the flow of your prototype and helps your team stay on the same page during the next day when you start to build your actual prototype. This step in the process really exercises how to think in flows and how to think through whole processes without getting lost in the details. On Thursday, your team gathers all their knowledge and expertise and creates a prototype based on the idea you chose on Wednesday. This very exciting part of the sprint lets your ideas come to life and helps you learn how to create a usable, reliable, realistic prototype with the lowest effort possible. We have a lot of different applications to use when creating a prototype. Our facilitators can help you and teach your team how to use these tools. You will also learn the basic rules of prototyping and on this day your team can use a whole variety of tools, depending on your project. We can also create certain prototypes even for offline experiences or real, offline products. Knapp’s team once even prototyped a whole clinic! So nothing proves impossible when it comes to prototyping! Friday makes for the most exciting day of the design sprint process! On this day, all the hard work done with your team during the week finally pays off. The day of validating your design has arrived: prototyping and testing ideas. On this day you test your prototype and gather feedback from real customers. First, one of your team members conducts an interview with the recruited customers. Next comes the opportunity to test your precious prototype. 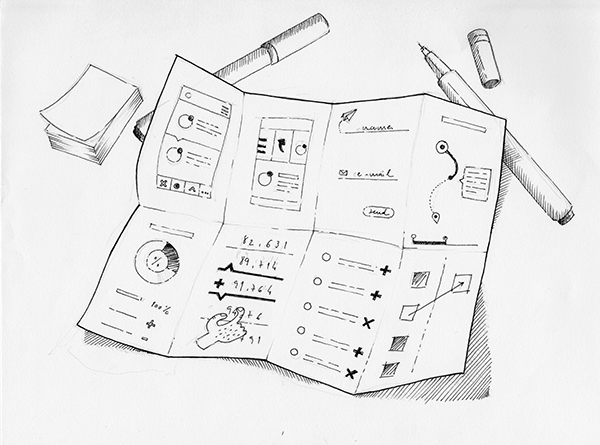 What you get back from user testing: valuable user experiences you can analyze. Your whole sprint team can observe the test with live online broadcasting. They will have a lot of real-life feedback for their ideas. At the end of this day, gather and talk through all the learnings gained during the tests. This lets you answer the most important question of your design sprint process. Now you have it! We consider these the main benefits of a design sprint process. What experiences have you had? Have you ever participated in a design sprint? Which favorite methods and parts of the sprint did you like best? Which parts you would change in the process? Share it with us in the comments below!